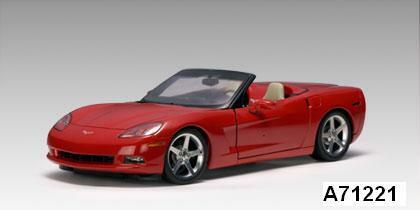 SALE Chevrolet Corvette Convertible Red C6 1/18 scale by AUTOart SALE, $199.99 at Modena Motors Inc.
C6 Corvette generation (2005-2012) In Victory Red on Shale Interior. Finely detailed including chromed wheels, carpeting and gleaming paint. Stunning details AUTOart is famous for. In Stock. SALE ON RED ONLY!!! While Quantities Last!! !